09 Sep 2004: Added a commit monitoring mailing list. It is intended to developers who want to keep in touch with developpement. Though the traffic on this list is not very high these days :) See Contact for further informations. 04 Sep 2004: Thanks to Jkx for setting up a mailing list manager :) A mailing list for XMLObject is now available. See Contact for more informations. 23 Aug 2004: Another maintenance release, fixing one very annoying recursive related bug reported by Ray, TD Travis and Fuzzy at Voidspace. I'm now providing Zip distribution archive in addition of tarGz. The HTML documentation is included in the distribution too ..
16 Jun 2004: Mainly a maintenance release, fixing a bug in TextNode, noticed by Joshua H. Rothenberg. See Changelog for more details. 13 Jun 2004: I've hacked a CSS tip to build a small menu. I did it quick and dirty, but it seems to work. 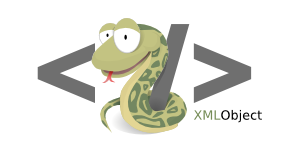 Beside these web-design news, I've planned another XMLObject release with XML-Schema support. Stay tuned ! 27 May 2004: After a little discussion on Ian's blog, I recognize it is a mistake to place XMLObject under GPL. The next release will be under a more appropriate licence. 23 May 2004: This is the first XMLObject release. Read the documentation to have an overview of what XMLObject can do right now. Generated on: 2004-12-12 16:46 UTC.